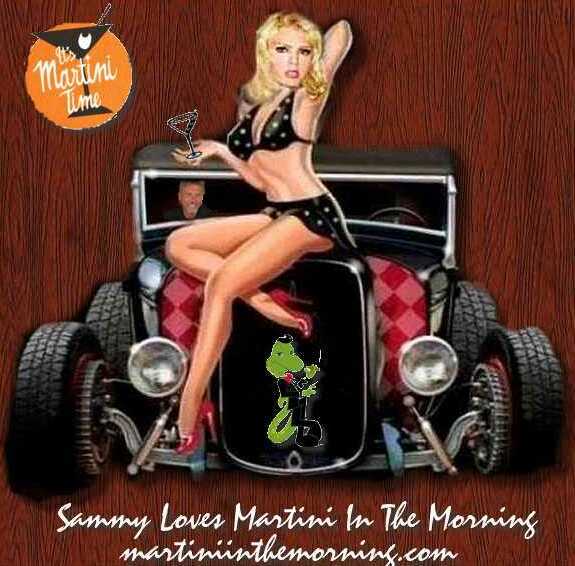 If you like Schmoozy SKATING music then tune into Martini in The Morning by clicking below. They even mention us! Hail there my subjects I'm Cerdic the very first King Of Wessex and the Wessex Tourist Board is MINE. I landed in Britain in 497AD and conquered the Britons with my Saxon legions. I now offer you the wares and wonders of my Kingdom. Come, Tarry a While & Enjoy. Just pick your delights below & click. Organised ice skating in Britain started in the Fens, more specifically Welney. 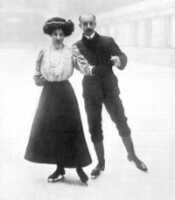 During the 1890’s it was the hub of English skating. The village church at Welney shows that there were many national champions, one of which, James Smart was professional world champion in 1895. This period was the Zenith of outdoor ice skating and, from this Fen enthusiasm for the sport, the National Skating Association (NSA) was formed in Cambridge in 1879 (now known as the National Ice Skating Association NISA). 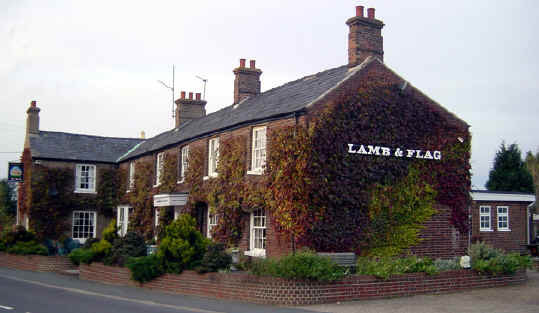 Welney has a dedicated Ice Skating Pub, The Lamb and Flag - and it is there you can view photographs of past and present speed skating champions from the area. Yes if it was not for the Fen Skaters of Welney and neighbouring hamlets and villages the NSA may have never been formed. Another little known fact is that ice hockey started in Earith in the mid 1800’s and was then taken to Canada; in fact it was called Bandy in those days. As the leading ice-skating website in the UK (Over 250 million visits) we request promoters of outdoor ice-rinks to inform us of the dates & venues for 2009/10 as early as possible. Skaters use this site to find out where there are ice-skating rinks. It's Official Somerset Girl Comes down Fastest : Amy Williams from Bath wins the Olympic Gold Medal in the Skeleton event at the 2010 Vancouver Winter Olympics. Bracknell Ice Rink is part of the Bracknell Ski and Snowboard Centre. Bracknell Ice Rink is a very busy ice rink. To allow as many groups, clubs and individuals access to the facilities the ice rink runs to a strict timetable. This timetable only fluctuates on days when there are special activities or school holiday sessions. If travelling from a distance please be sure to double check the session times before arriving.A number of ice skating courses aer available aswell including "Learn to Skate", "Beginners Skate", "Crash Course", adult courses and parent and toddler courses too! Special Skating Birthday Parties can be arranged while disco skating sessions are offered at the Bracknell Ice Rink each week, both at the weekend and after school. Windsor ice skating Back after a brief hiatus, the Windsor ice skating season is making a very welcome return in 2011, ready for afternoons and evenings of ice skating fun in stunning London surroundings. It’s time to take advantage of the huge outdoor ice rink at the Royal Windsor riverside park, transforming Alexandra Gardens into a spectacular London ice rink venue. 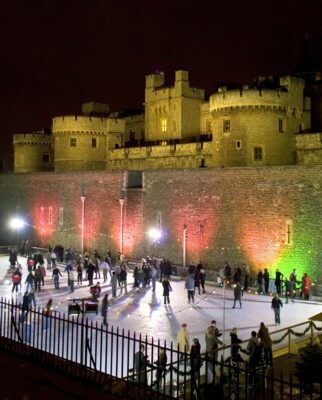 So if that sounds like fun, get your Windsor ice rink tickets and get ready to glide across the ice.Ice skating in a beautiful Victorian setting of Alexandra Park Gardens in Windsor with views of the castle and next to the Thames. The real ice rink will cover some 800m2 (8,600 sq feet) while ice rink cafe will sell warming hot chocolates, mulled wine and festive snacks. Planet Ice in Central Milton Keynes has a lot to offer the Ice Skating enthusiast. If you're interested in a little light recreational skate or would prefer some figure and dance then Planet Ice offers it all for the novice and the pro! Slough Ice Arena is a great place to come for an evening out with your friends or family. Great music, DJ's, games on the ice, lighting effects and refreshment zones make for a memorable time. 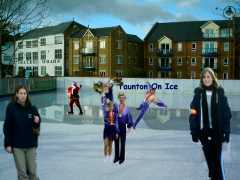 You've probably seen us on the TV recently as we have become one of the main training venues for ITV's Dancing on Ice. If you have been inspired then why not receive some expert coaching and tuition by signing up to one of our courses. 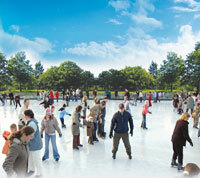 Cambridge On Ice returns for a fourth year to the beautiful setting of Parkers Piece. The real-ice rink will be open for a six week season from Saturday 20th November to Sunday 2nd January inclusive (closed Christmas Day). Planet Ice offers a wide range of sessions through out the week, including a family dicso session, 'snowbabie', for children age 18months to 5 years. Prices range from £3.40 to £6.00 for all sessions, please see website for full details. Concessions are available. Booking is advisable. There are different kinds of skating session at our rinks, such as Public Skating, Skool Skate, Chill Out, Disco Skate, Easy Skate, Disco Revival and Family Skate sessions. Please see the timetable for specific times. Our magical ice rink is back with a new glacial theme for 2011. In addition to our general skating sessions, there are special sessions for all ages and abilities, so come on down and get your skates on! Eden Project ice rink Book your skating session. 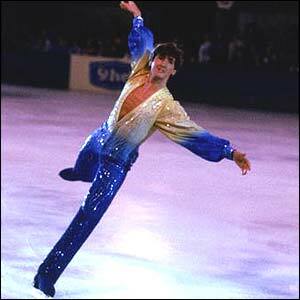 There is limited capacity for all our skating sessions, so please pre-book to avoid disappointment. Chilly Penguins sessions: Fun sessions for 6–12 year olds that features team games, races and the chance to win prizes! Six-week skating courses, suitable for all abilities. Starting dates are 5 and 9 November and 4 and 7 January. These lessons must be booked in advance. Superskate sessions: Experienced skaters only – this is your chance to tear up the ice! Sessions last 40 minutes. School skating sessions: These 40-minute skating sessions are exclusively for school groups, year 3 and up (maximum of 150 pupils per session). Infants on ice play sessions: These non-skating, ice play sessions are exclusively for under sevens from nursery and school groups (maximum of 100 children per session). To book, go to www.edenbookings.com or call 01726 811972. The 18th century courtyard of Exeter Castle will be transformed into an enchanting icy world this Christmas - complete with a great open-air ice rink. Just a 2 minute walk from the High Street, the magical ice rink includes a 50ft Christmas tree and twinkling lights. There are coaching sessions if you feel nervous on the ice, and if you don't want to skate, have a seat in the marquees, where you can watch the skaters on video screens. Plymouth Pavilions boasts the only ice rink in the South West, the Swiss Lake Ice Rink is fitted with a state-of-the-art light and disco system so the regular ice discos held here have the best sound around. The rink has full disabled access and there are various types of sled available for use on the ice. 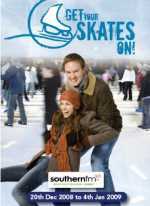 Skating starts on Saturday 6th December and runs through until Sunday 22nd February. Situated in the Purbeck Hall the BIC provides a perfect venue for winter skating. With a large car park adjacent to the building and inhouse catering facilities everything you want is under one roof. Children from the age of 4 are welcome to skate however children aged 4 - 12 must be accompanied on the ice. Sessions last for 1 hour 30 minutes this includes getting on and off the ice. Small Ice rink, Suitable for kids. Open seven days a week 10am to 6pm. The cost for skating is £4 for under 12’s and £5 for adults for a 45 minute session (skate hire included). 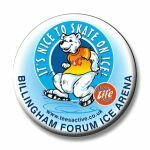 The Billingham Forum Ice Arena offers a wide range of skating activities for all the family including public skate sessions, family only sessions, ice skating parties, figure skating, private lessons, disco sessions. In addition Billingham Forum Ice Arena is home to not one, but two Ice Hockey Teams, the Billingham Bombers and the Cleveland Comets. Please note that occasionally routine maintenance or unforeseen circumstances may affect activities at the Ice Arena. Therefore it is always best to contact Billingham Forum before setting out to avoid disappointment. The Ice Rink will re-open Saturday 22nd November 2008. Plenty of parking and good access ensures Festival Leisure will provide a perfect skating home for this winter. With plenty of restaurants to choose from the leisure park provides a fantastic family day out for all. This year the ice rink and its facilities are covered by a fantastic marquee allowing skating whatever the weather. On good days the sides can be taken down. The latest in sound and lighting effects combine with a lively disco atmosphere in Riverside's ice rink, one of only two rinks in the whole of Essex. It's also the home of the Chelmsford Chieftains Ice Hockey Team and the venue for their exciting home matches. Rink-side facilities at Riverside include a fully licensed bar, cafeteria, hot and cold vending and seating for over 600 spectators. There are over 2000 pairs of skates available for hire at the rink. The programme for the Ice Rink has been specially designed to provide the widest possible range of entertainment and enjoyment for everyone. From sessions for the whole family to the late evening disco sessions, ice dance, ice hockey, private lessons, parties and courses. Please note that session times are different during Essex County Council term and school holiday dates. Riverside Ice and leisure is located in the centre of Chelmsford and is signposted as the 'Leisure Centre'. There is a large car and coach park next to the Centre. We cater for all levels and interests - we have a wide ranging programme with a session or activity to suit all. Come along to Southend High Street where an Ice Skating Rink, with real ice, is located outside the Odeon Cinema. Spinningfields Ice Rink proudly returns to Manchester for the winter of 2011/12. In a great location, situated at Hardman Square in the heart of Spinningfields, with a very festive addition this year - our pop up Canadian log cabin The Moose Bar. 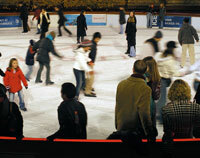 The large ice rink can accommodate up to 200 skaters at any one time. Spinningfields Ice Rink invites you to come and enjoy some exciting wintertime fun for all ages. The perfect destination for extra special Christmas and New Year celebrations! Enjoy the excitement of skating outdoors and as night falls, join skaters of all ages on the ice to skate under the magnificent canopy of twinkling lights. This Christmas, Piccadilly Gardens hosts Manchester's ultimate winter experience. Get your skates on as the Salford Ice Rink returns to the Civic Centre Lawns for another fun filled festive season for the whole family. It's the perfect seasonal day out for everyone to enjoy and a great chance to show off your skating skills once again. This year there is also a fantastic funfair, perfect for some festive family fun. Basingstoke Ice Rink has a range of weekly events to help all the family enjoy ice skating including Ice Tots, Disco Sessions, Student Nights, and special Family Skating Sessions too.In addition Basingstoke Ice Rink is home to a wide range of clubs including The Basingstoke Ice Skating Club for figure skating, ice dance, synchronised skating, the Junior Hockey Club who offer special 'age separated' ice hockey training sessions for under 10s, under 12s, under 14s, under 16s and under 19s. Training session are also held weekly for the Basingstoke Lady Bears Ice Hockey Team, the Basingstoke Lady Bison Ice Hockey Team, the Basingstoke Buffalos Ice Hockey Club, the Basingstoke Hyenas Ice Hockey club and the Basingstoke Cougars Ice Hockey club. Due to the wide range of specialised sessions offered at the Ice Rink we strongly advise customers to always ring the ice arena before setting out to ensure their session is available because Ice Hockey and other events can affect the timetable, both at weekends and on weekdays. Gosport Ice Rink is situated on the A32 into Gosport, situated in a large park with children's play area, adjacent to Holbrook Recreation Centre. The Centre offers an exciting programme for beginners and well-established skaters. Ideal for coach parties, day trips or group outings. Safety is of paramount importance therefore trained skate martials supervise all public sessions. Facilities at the Gosport Ice Skating Rink include a 40 metre by 20 metre indoor ice skating rink, public and family ice skating sessions, ice skating lessons, ice hockey, ice skating parties, a cafe, bar and skate shop. Fantastic ice rink with sound and lights. Public skating 7 days a week, ladies night, after school skate, hockey skills and weekend disco sessions. Delight in the magic of Marwell during the festive season where winter is being welcomed with open arms. Pick up some tips from the penguins and manoeuvre your way around the large outdoor ice rink which is being assembled for the occasion. The state-of-the art ice rink will join the popular German Market as a special Christmas attraction for city centre shoppers and workers. The Cafe in the Square will serve tempting refreshments. Grab your hat and gloves and head to Winchester's Christmas ice rink. Set in the grounds of the beautiful Winchester Cathedral, there’s also an adjoining café offering stunning views of the cathedral, and a great Christmas market for those last-minute Christmas gifts. Get your skates on and come on into Hereford, where Burgoynes (Lyonshall) Ltd are providing a Skate Rink in Hereford City High Town for the 2nd year from Saturday 26th November until Saturday 31st December 2011. Join us on Saturday 26th November, and come and meet the Wyvern Street Stars who will be at the rink most of the day having a skate, having a fun time and entertaining the crowds. With the Christmas Fayre, Farmers Markets, Park and Ride, Late Night Shopping and other events all happening, our skate rink is an exciting addition to the centre of Hereford for people of all ages. The Skate Rink offers great fun and exercise for everyone to enjoy this winter, with Seasonal Decorations and Christmas songs adding to the festive spirit. Not Skating? - Then enjoy the atmosphere by watching your friends and family skate, or enjoy a hot chocolate or cup of tea from one of the outlets in the city. If you wish to book the ice*rink for you and your friends then please call 07979 536115 to book your slot. 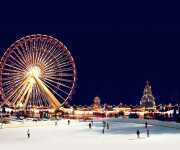 With over 30 days of skating on offer from November 26th until December 31st, this is a must do Christmas experience. We look forward to seeing you on the ice*rink! Why not combine all your Christmas shopping with a visit to the spectacular new, outdoor Ice Rink at Bluewater this festive season!The award winning, ice creation team behind ITV1s Dancing On Ice, will transform the outside of the Water Circus into a stunning ice rink experience open . We also welcome non-skaters and spectators to watch the fun from one of the galleried restaurants or Cafs.Daytime is a delight as you skate in the spectacular setting of Bluewater itself. As darkness falls the rink is transformed with flaming torches and festivelighting to illuminate the facades of the courtyard. So what you waiting for, get your skates on and book your tickets now! One of the South East’s most visited attractions over the last 21 years and continues to be a centre of sporting excellence in both Ice Hockey and Figure Skating.The rink is open all year and welcomes visitors 7 days a week for public skating and can offer a full size ice pad with seating for 800 spectators. Located conveniently just off the M2 at Junction 4 the rink offers everything you could want for a fun day out. Whether you're looking for a fun family day out or you've set your sights on being the next olympic gold medal skater, Blackburn Ice Arena has it all. As the North West's Regional Centre of Ice Skating Excellence, the Blackburn Ice Arena facility offers something for everyone. With year round skating, disco sessions for both juniors and seniors, family skating and holiday fun. Blackburn Ice Arena is much more than just an ice rink... Warm up after your skating session on the ice with a tasty snack or drink in the Arena Cafe while the Skate Shop has everything for the ice and figure skating. Bespoke equipmant packages can be created for you with advice by one of our professional coaching team. The Blackburn Ice Arena is also home to TheBlackburn Hawks Ice Hockey team. Why not discover a cool way to spend your day in the world's oldest purpose-built ice theatre. The Arena at Pleasure Beach, Blackpool plays host to the magnificent Hot Ice show in the evening, but during the day you can don your skates for a slice of ice. Skate on ice, ride in a toboggan, see the Reindeer and of course have all of the usual fun that you can find at Twinlakes! Leisure centre comprising fun pool, ice rink, gymnasium, sportshall, squash facilities, tennis facilities, table tennis, badminton, bowls (indoors), 5-a-side, netball. Something for everyone. London has eight ice rinks: Hyde Park, the Natural History museum, Canary Wharf, Somerset House, Tower of London, Kew Gardens, Greenwich and Hampton Court Palace. Dates, times and prices vary, but keen skaters can take to the ice on November 5 at the Natural History museum and skate all the way through to February 21 at Canary Wharf. Somerset House is perhaps the best known. The city-centre location and atmospheric buildings lend a Victorian-Christmas air to proceedings and guarantee queues – best to book. Enjoy skating in the open air, in wonderful surroundings on a magnificent real ice rink is guaranteed to enthral all at the Hampstead Heath Ice Rink at Parliament Hill Fields. The Fields Cafe alongside the ice rink (no entrance charge) will be serving warming drinks and festive snacks for those wanting to take it easy and relax after their skate or whilst watching others take to the ice. I'll give this rink points just for the creativity of its location - on the Aquarium roof terrace at County Hall, next to the London Eye. With its elevated position, there are great views up and down the Thames, with the Houses of Parliament directly across the river. But it's another synthetic surface, and the smallest rink of the five - it would feel tight at its maximum capacity of 50 people.Off-ice facilities: The South Bank is on the doorstep, so you don't have to go far for hot food and drinks. The rink attracts dozens of children every day and is crowded with adults at night. Hyde Park Winter Wonderland, London's largest and most dazzling winter event returns to the heart of the Capital for six whole weeks of festive fun. With no admission fee, Winter Wonderland offers a whole day-out from 10am to 10pm with beautifully themed attractions set out under thousands of twinkly lights. With over 1.5 million visitors to date, Winter Wonderland introduces even more rides, attractions & games never before seen in the UK, spread across Hyde Park's historic parkland. Once again the event features London's largest Ice Rink, and the iconic 50m Observation Wheel, with 40 heated pods offering truly spectacular views across the city and two circuses: The Cirque D'Hiver and Zippo's Christmas Circus. Kew's historic landscape is hosting an ice rink in front of the spectacular Temperate House, where last year this proved to be a magical place to enjoy winter days and nights. Around the rink there will also be ample opportunities to relax with a range of refreshments. Due to popular demand, this year the main rink will be larger than ever. Attractions include a children's rink for younger skaters, stylish Café Bar and a classic fairground carousel. Surrounded by 76,000 fairy lights in the nearby trees, it's the perfect way to welcome in the winter season with family and friends. Whether you are a novice or an expert, don't miss the chance to skate against the most spectacular backdrop London has to offer. Positioned in the heart of one of the most stylish cities in the world, the Natural History Museum Ice Rink epitomises the glamour of the capital during the winter months. Located on the Museum's east lawn and now in its fifth year, it has established itself as the place to be seen skating. So wrap up in your winter warmers, savour the atmospheric setting and finish by enjoying a hot chocolate in the Cafe Bar. The hugely popular Café Bar has been voted one of London's best festive bars by The Evening Standard. It offers visitors a bird's eye view of the ice as they relax in the ultra stylish surroundings on the open-air balcony. Take the opportunity to soak up the dazzling setting while sipping a glass of mulled wine or a bespoke winter cocktail. The Natural History Museum Ice Rink has plenty of additional surprises in store for visitorsŠ watch this space for more details. This Christmas, Westfield London will be cooler than ever as an indoor ice rink takes over the Atrium. Made with real ice and situated indoors, it’s the perfect place to go ice skating in London. Glide over the ice and take in views of the Olympic Park... Westfield Stratford City is celebrating its first Christmas with an amazing outdoor ice rink in Chestnut Plaza! Whether you want to make the perfect date with a skate followed by a meal in one of our great restaurants or bring the family and enjoy along with a day of Christmas shopping, our ice rink will be open morning, evening and night. Advance booking allows you to book the session time you want and get a discount! That leaves you more money to spend in the shops and get special offers in some of our restaurants. 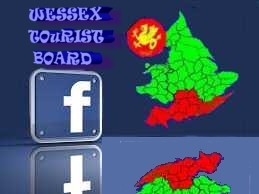 For information & advance bookings visit www.seetickets.com or phone 24 hr booking line on 0844 412 4640 & mention the Wessex Tourist Board. Canada Square Park will transform into a unique ice-skating facility, set against one of London's most breathtaking backdrops.Nestled beneath the world famous Canary Wharf towers, the ice rink will offer entertainment seven days a week. The adjacent Moose Bar will provide warm and welcoming refreshments for thirsty skaters including delicious mulled cider. The rink will be situated next to the new Park Pavilion in Canada Square, home to Canary Wharf's newest bars and restaurants. The skating season runs until 20 February 2011 with the rink open between 9.45am and 11pm Monday to Saturday and 9.45am-7.30pm on Sundays. 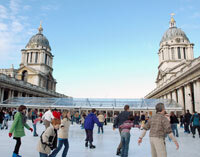 Following the success of last year the Old Royal Naval College will once again host a real ice rink within its landscaped grounds on the banks of the River Thames in the centre of the Maritime Greenwich World Heritage Site. It has magnificent views looking up to Queen’s House and the Greenwich Observatory, and also across the Thames to the many lights and buildings of Canary Wharf. The River Views Cafe alongside the ice rink (no entrance charge) will be serving warming refreshments and festive snacks for those wanting to take it easy and relax after their skate or whilst watching others take to the ice. Christmas comes but once a year and when it comes to The 02 it brings good cheer, a 30 meter high swing ride, traditional pfannkuchen, German beers and a white knuckle zone of thrill rides including a Reindeer Rollercoaster. This transformation will spread inside and outside The O2 across a 10,000 square meter area offering the public sheltered areas to enjoy the attraction whatever the weather. The Christmas Fair offers visitors a free Santa Claus from noon daily and customers can purchase passes to enjoy unlimited access to the rides (over 25 in total) for one low cost of £17.50 for children and £20.00 for adults. The variety of exciting fun fair rides will suit both adults and children, turning the worlds most popular entertainment venue into London's newest theme park. The O2 Ice Disco is located in the tent in The London Piazza by The O2 Arena. Forget your traditional festive skating experience (think: sheet rain and mind numbing Christmas jingles on a loop), because our Ice Disco is a futuristic weather proof party destination with a vast 900 square metres of ice for 250 skaters and a fabulous purpose built bar and viewing area. Even if you and your partner are more Orville and Mr. Bean than Torville and Dean... you're sure to have a blast at The O2 Ice Skating Rink Ice Disco! Ice Skating Club – Every Saturday - Ice Skating Tuition – private lessons or classes for all ages - Toddlers on Ice – every Tuesday during term time - Birthday Parties - Includes meal & tuition - Children's Skating Courses - After school course for 5-15 year olds hildren's Crash Courses - Throughout most school holidays - Ballet Classes - Ice Dance Club - Disabled Skating -Adult Skating Courses .With a total capacity of 1,250 including a seating area for 741 plus one Cafe and a bar, the Ice Rink provides the perfect leisure day out. 22 metre wide circular outdoor ice rink in the heart of the City, surrounded by bars and cafes.Between November and April Broadgate Circle is transformed into the City of London's premier outdoor ice rink providing occupants and visitors alike, with the opportunity to have some fun and try out their skating skills on the ice. There are plenty of sessions throughout the day to cater for everyone's busy schedules and there is even the chance to hire the rink for private parties and corporate entertainment Private Hire Information on certain days in the week. Skate hire and private or group lessons Ice Skating Information are all available at a small cost. The Ice Centre is the Centre of Excellence for the South of England and has a 56m by 26m ice pad that provides ice skating for all levels and abilities, from beginners to international competitors. The Centre has public sessions 7 days a week at various times and a learn to skate programme which operates 6 days a week for children and adults.The Ice Centre was opened in 1984 by Torvill and Dean and was host to an international Gala the same year. Many skating champions have been trained at the Centre, some of which have gone on to represent Great Britain. Ice hockey teams from junior to Super League have also trainined at the Centre. The Ice Centre is and has been a major venue for skating events which include, British championships, internationals, regional competitions and is now a firm favourite for such events. 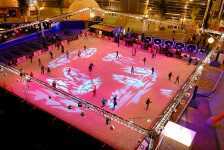 The largest Ice Rink in London with climate control and state of the art sound and lighting effects. The only ice rink in London open 364 days per year, Queens Ice Skating Rink specialise in skaters of all abilities, so whether you're a first time skater or experienced we guarantee you a memorable experience. Spectators can watch the fun from our warm climate controlled viewing areas or simply relax in the fully licensed food and cafe bars offering speciality coffees, luxury hot chocolate and fine wines and beers. 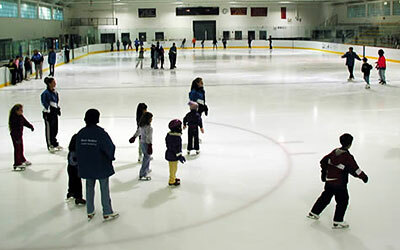 Sobell Ice Rink offers a variety of classes, courses and open sessions for all abilities. Open Mon-Fri except Wed: 10.30am-3.30pm, 4.15pm-7pm. Sat & Sun 10.30am-5pm. Family fun session on Saturday at 5.30pm-7.30pm. Tuition courses available. Parties catered for to include food, cake and as long as you like on the ice. Please book well in advance. 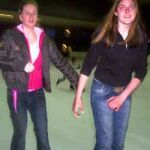 Norwich Ice Rink has a range of weekly events to help all the family enjoy ice skating including Ice Tots, Disco Sessions, Student Nights, and special Family Skating Sessions too. Escape to a magical winter wonderland in Norwich this Christmas. The Ice Rink at The Forum Shopping Centre is decorated with 30,000 twinkling lights, making it a beautiful place to skate with your friends or family. The rink also offers Parent and Toddler skating sessions so your little ones don't miss out. Whitley Bay Ice Rink is used by thousands of people each week. So, whether you are an experienced ice skater, hockey player or absolute beginner, the Whitley Bay Ice Skating Rink is available all the year round for you to have fun. There are weekly Family Sessions, Skate Sessions, Disco Sessions and Group Tuition Sessions. In addition the ice rink is home to the Whitley Warriors Ice Hockey team. The £43 million National Ice Centre was the first twin Olympic-sized (60m x 30m) ice rink facility in the UK. Situated in the city’s fashionable Lace Market, the NIC is just a short stroll from the Old Market Square and provides top class facilities and coaching staff for a whole range of ice sports from Free Skating and Ice Dance to Synchronized Skating, Ice Hockey and Short Track Speed Skating. The Nottingham Panthers also train here and use the venue for their home games. The National Ice Centre isn’t running an outdoor ice rink in Nottingham’s Market Square this year but don’t worry, you can still have a go at the ultimate seasonal sport. For the first time ever throughout December we’re transforming our ice pad here at the NIC into a Winter Wonderland. You won’t recognise our ice rink as we’re draping the walls and turning on hundreds of twinkling lights. With huge hanging snowflakes adding to the festive feel and your favourite seasonal tunes playing, this will be a fantastic yuletide experience. Even the wet or gloomy weather can’t dampen our Christmas cheer as we bring the magic indoors this year. We’ve got the ice and we can make it snow on demand at selected sessions with our new snow machines! And because it’s Christmas we’re keeping all our skating prices the same. Sutton Ice Skating Rink offers great entertainment and sessions to suit varied age groups and abilities including: Generation - for all the family, young or old. There's music for everyone, disco lights and snow; Sub-Zero - It doesn't get any cooler, latest sounds, best DJ's, lights and snow; and Evolution - Massive sounds and fun for starters up to 13 years. In addition parent and toddler sessions with toys and games to teach under 5's to skate are available. A learn-to-skate programme suitable for all ages and abilities from complete beginners to the more advanced. The Sutton Ice Skating Rink run by SLM adheres to the IRMA National Guidelines for ice rink management. Telford Ice Skating Rink has a wide and varied skating programme suitable for all ages and abilities. Come along and try one of the sessions we have to offer. Visit Telford Ice Skating Rink during the day when there are quiet sessions with background music and lighting, or come along to an evening session and skate to the latest sounds and low lights. A range of ice skating lessons are available including Taster Sessions, Crash Courses and Regular Courses. In addition a range of activities are on offer including special Tots on Ice sessions, Ice Skating Parties (for children aged between 5 and 12 years) and special school holiday Daytime Sessions. Telford Ice Skating Rink is home to the Telford Tigers ice hockey team. Thursday 10th November until Sunday 8th January 2012 (except Christmas Day and New Years Day). Located at Castle Park in the centre of Bristol, this magical ice skating rink returns. A heated marquee alongside the rink will be fully licenced and serve hot and cold food. 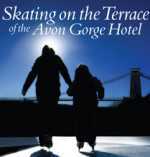 The rink is on the terrace of the Avon Gorge Hotel (visit www.theavongorge.com for directions). Access to the rink is via the White Lion Bar and via princess Lane (please be aware there are stairs to access the terrace via princess Lane). The Bristol Ice Rink is located in the heart of Bristol City Centre and offers the opportunity to skate in a safe and enjoyable atmosphere. Bristol Ice Rink offers public ice skating sessions for all types of ice skaters including a full Learn to Skate Programme aswell as a Junior Ice Hockey Programme. Also, don't forget that while the kids are out there ice skating mums and dads can relax in the fully licensed bar or have a meal in the rink cafeteria. Come down to Clark's Village this Christmas where there's fun for all the family! Get Your Skates on and have a go on our Skating Rink or why not make a visit to Santa's Grotto where there are presents for everyone! Look out for Clarks Village Christmas Skating Rink open daily from Friday 14th November - Sunday 4th January 2008. 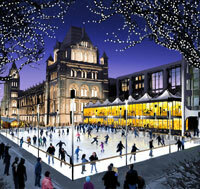 This is an environmentally friendly synthetic skating rink which will be located within the central eating area. Adults £6.50 Children £5.50 (Up to the age of 14 years) OR Buy a Skate and Grotto ticket for £9.00 Everytime you purchase a ticket you will be entitled to some amazing extra savings in one of the many stores at Clarks Village! Trentham’s real ice rink is back in its beautiful lakeside setting from the Christmas Launch on Friday 18 November, to the end of half term, 19 February. Hot and cold drinks and snacks are available at the rink side. See session times and prices below. Come on, give it a whirl! Make the most of outdoor ice skating at Hampton Court with coveted Hampton Court ice rink tickets this winter. There's nothing better than getting in the Christmas spirit with some ice rink tickets, and those at Hampton Court will ensure you have a great time and feel really festive whilst you're at it. Winter ice skating at Hampton Court ice rink Hampton Court ice rink tickets are available for a sixth consecutive year, as the outdoor ice rink is created once again for six weeks of London ice skating on the west front of Henry VIII’s red brick palace. Never too late to Skate. Brighton’s Royal Pavilion Christmas ice rink and restaurant is back by popular demand, opening to the public November 12 - January 22. The ice rink in the grounds of the palace was set up for the first time last year and attracted thousands of people The rink to visit outside of London, with quirky little independent shops on its doorstep for Christmas shopping heaven without the London crowds, it’s viewed by many as the most romantic and beautiful setting for a Christmas rink in the country. Take a turn on the ice in front of this Royal pleasure palace, sink into our comfy leather chesterfields with mulled wine in hand or book a family feast fit for the Prince Regent in our beautiful rinkside restaurant..would Christmas be Christmas without a visit? ce rink open 10am – 10.15pm, November 12th – Jan 22nd every day except Christmas Day. Sessions must be booked through the on-site ticket office or via Ticketmaster and are one hour long. Bar and restaurant open 10am – 12.30am. Please call 07530 524964 for more details. The North East's biggest and most popular ice rink is located at Times Square. There's no better way to enjoy a winter's day or night than skating here. 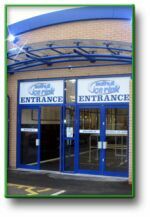 The Coventry Ice Rink is located at The Planet Ice Arena in Croft Road, Coventry. Apart from Public ice skating sessions, the Coventry Ice Rink is also home to the Coventry Chaos Ice Hockey Team, the Coventry Phoenix Ladies Ice Hockey Team and the Coventry Junior Ice Hockey Team. 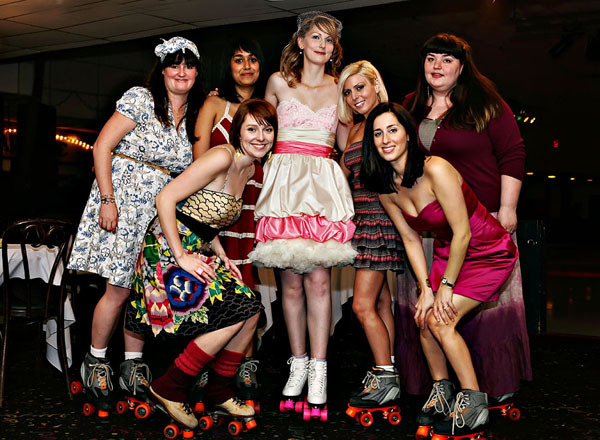 In addition to public ice skating sessions, private Birthday Parties are catered for while the Galaxy Gliders provide one of the most enjoyable learn to skate programmes in the UK today. Each week you will receive expert tuition which starts you off from your very first tentative steps onto the ice up to completing the whole course with your first single jump! Galaxy Gliders is suitable for all the family no matter what your age or ability. Come and have some good family fun and learn to glide across the ice with confidence. Family Fun - Come along to Solihull Ice Rink for a great day out! Go and get your ice skates and take to the ice pad, you'll have plenty of fun skating around. When you want a break go and enjoy a meal at the Ice Burger cafeteria or relax in the warmth and comfort of Checkers Bar which opens up into a parents lounge every Saturday and Sunday daytime. (No unacompanied children are allowed in the parents lounge). Every Saturday and Sunday the public session starts from 11.00am to 4.00pm. There is a FREE disco with live DJ from 1.30pm to 4.00pm so come along for a memorable experience. (Please be aware that on all disco sessions there will be strobe effects from the disco lights).Bob Skates are available for hire for small children. They have a twin blade to aid a steady balance and fit over a childs shoe (up to a child size 8). Just ask at the Box Office upon arrival for a pair of bob skates (subject to availability with a £5.00 REFUNDABLE deposit). Why not come along to the 'family friday' session, every friday 5.00pm until 6.30pm. This is a quiet session ideal for parents with young children! Look out for the 'exclusive family friday offer' vouchers (handed out via the box office)where a child under the age of 12 can skate for FREE when accompanied by a parent paying for admission and skate hire (only 1 child free per every full paying parent). 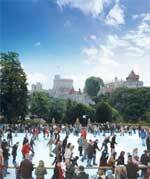 UK first as this year Warwick Castle discards the traditional rink and gets set to install a 250m long ice river. The trail will take skaters through the grounds and round the castle, past a number of Victorian-themed events including Ebeneezer's haunted tower, Carter's steam fair, carol singers and Victorian fairground rides. Day tickets cost £17.95 for adults, £7.95 for children. Evening tickets (5pm-7pm) costs £7.95 for adults and children. Family tickets (two adults, two kids) cost £52. The rink in Chamberlain Square is surrounded by amazing Victorian architecture. 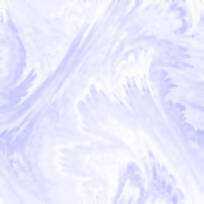 Breaking with tradition, the L-shaped ice surface is synthetic, a kind of plastic composite. I was sceptical, but it is surprisingly good. It feels funny at first, not as slick as real ice but easier to skate on, and good for beginners.Off-ice facilities: next door, at the German Christmas Market in Victoria Square, you can refuel with hot food and drink, and do some last-minute shopping. Tickets are available at the venue or can be booked in advance through the Central Library Ticket Shop 10am-5pm, or by calling 0121-236 5622. The international-sized ice pad at the Swindown Ice Skating Rink at the Link Centre is recognised as a 'Centre of Excellence' for both figure skating and ice hockey. it is an approved national centre for squad training for the National Ice Skating Association and British Ice Hockey Associations, it is also a NISA approved regional test centre and it provides the south-west with a popular attraction which offers sessions for all ages and abilities. The Swindown Ice Skating Rink offers a range of ice skating session to suit everybody incluing General Skate Session, a mixed session of easy listening music allows you to practise your skating skills on the ice. Evening sessions include dance intervals; Family Skate Session, this session is aimed at younger children and families, a mixed selection of music caters for all tastes whilst you skate in a safe and friendly environment; Disco Session, an upbeat session aimed at teenagers, with disco lights, music and non-stop action on the ice, children Under 12 years of age must be accompanied by a responsible adult; Family Disco, similar to the disco session but in a more controlled environment which is suitable for younger children and families; and Children's Sessions, a skating session aimed specifically at children aged 5 to 12 years of age. Mums and dads, brothers and sisters are encouraged to join in. In Trowbridge a lack of Christmas snow won't be stopping festive skaters having a bit of spin on the town's first ever open-air ice-skating rink.Due to be sited in the centre of the town's 'Christmas Village' the 400 foot square synthetic ice rink will be open for action from Thursday 30th November through to Sunday 3rd December.Made of a plastic composite, the synthetic ice surface may not be cold but being less slick than the real thing it promises to be easier to skate on and perfect for beginners. of the HSBC Bank on Fore Street in Trowbridge. 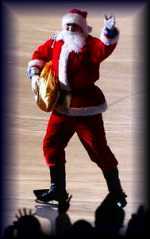 rink will be open on Saturday 16th December from 10.00am to 4.00pm and will be located on Market Place in Westbury. Children should wear trainers, old trousers, jumpers and gloves. Refreshments available. The Bradford Ice Arena is on the first floor above Mecca Bingo and adjacent to the National Museum of Film Photography and Television in Bradford. It is also close to the Alhambra Theatre and the Central Police Station. Bradford Ice Arena is also in easy reach of the Bradford Interchange for buses and trains. Bradford Ice Arena is open for public skating 363 days of the year (closed Christmas Day and New Year's Day). Bradford Ice Arena specialize in themed birthday parties for children age six to fourteen and these can be arranged on most public sessions apart from those on Friday night and Saturday. There are two packages which include admission to the public session, skate hire and a meal. Cakes and goodie bags can also be provided. The Stars Party Suite is also available for hire to private parties of up to 400. A Skate Shop is also available for all your ice skating needs. The Doncaster Dome provides an excellent range of sports, leisure and fitness facilities to cater for all types of people, from the beginner and recreational user, to the dedicated sports person or enthusiast including the UK's first split-level Ice Skating Rink. The revolutionary Hot Ice ensures that everyone can comfortably ice skate all year round. The Ice Caps timetable is second to none with Disco Nights, Happy Hour, Family Disco's, Foam Nights, Themed Ice Skating Sessions and Ice Skating Lessons - at The Doncaster Dome you have got the pick of the crop! Come ice skating in the courtyard of this truly stunning Grade I Listed Building. Whilst you're here, you can shop at the Piece Hall's 40 plus independent shops and the Woolshops Shopping Centre close by. The Hull Arena was renamed in April 1996 having been formerly known as 'Humberside Ice Arena'. Since then the Hull Arena's reputation as 'The most versatile venue in Yorkshire' has grown from strength to strength. The Hull Arena has an olympic sized ice rink, fully licensed bar & cafeteria. Experience the magic of open-air ice skating this winter on one of Europe's largest outdoor ice rinks in Millennium Square Leeds.Millennium Square Leeds is once again transformed into a unique winter wonderland with over 1,250 metres of real ice, the equivalent of 4.5 million individual ice cubes, smack in the middle of Leeds city centre.By popular demand another cold front settles in Yorkshire in 2008 as the UK's largest temporary open-air ice rink makes a welcome return to Leeds city centre for another sell-out season.Now firmly established as Yorkshire’s most popular wintertime attraction, Leeds City Council are proud to welcome back the Ice Cube to the stylish civic setting of Millennium Square, offering visitors of all ages the chance to get their skates on and take to over 1200m2 of real ice!The rink is open every day 16 JANUARY to 7 MARCH 2010 [Weather permitting] from 10am to 9.30pm (10am to 7.30pm on Sundays) for people of all ages and abilities, with trained Ice Marshals on hand to teach beginners and offer friendly tips and advice. Following a successful introduction last year, the 10m2 nursery rink also returns with a safe haven for children aged 2–8 to find their feet on the ice for the first time! opening times and skating schedules! Ice Sheffield opened its doors to the public in May 2003. Sport England funded this £15.7 million major development, a joint project between Sheffield International Venues, Sheffield City Trust, Sheffield City Council and Governing Bodies.This state of the art venue is the regions premier twin padded ice rink and has already hosted a wide range of prestigious events including the British Adult Ice Dance Championships and the British Ice Figure and Dance Championships in 2003 and 2005. Ice Sheffield has played host to a number of dry events including the National Judo Championships and the venue has also featured on the high profile Channel 4 series ‘The Games’ for three consecutive years! Ice Sheffield is totally committed to catering for the interests and aspirations of the whole community - offering recreational skating, learn to skate sessions, children's birthday parties and ice disco sessions... all running hand in hand with the elite performances and ice sports development. Bridging the gap between the fun skater and those in pursuit of excellence, Ice Sheffield offers a mixed programme of activities. York’s most popular Christmas attraction, the outdoor ice rink, The Ice Factor, returns this November to its new location at McArthurGlen’s York Designer Outlet, celebrating its seventh successive season in the historic city. Located outside the designer outlet, the award-winning Ice Factor promises to be better than ever this year as the ice rink will become the centre piece for Yorkshire’s Winter Wonderland surrounded by a festive market and traditional fair rides alongside the skating, all adding to the Christmas magic. If you haven't had enough by the time you've spun round the two rinks in the shadow of Edinburgh Castle, hop on the train and take in the one in George Square, Glasgow. If you still want more, head to Inverness after Hogmanay in the Lowlands, where they celebrate "the old new year" on January 12. The fèis gheamhraidh Inbhir Nis – Inverness winter festival – runs from November 22 to January 12 and includes an outdoor ice rink at its heart. The finale of "An t-Seann Bliadhn' Ùr" (the Old New Year), sees a flaming torch parade through the city, ending at Kessock Bridge for a fireworks display. Overlooking the North Sea and adjacent to the Beach Leisure Centre, the Linx Ice Arena is one of Scotland's premier skating facilities. Opened in 1992 the Linx Ice Arena offers a ''national size'' ice pad, 56m x 26m, with spectator seating for up to 1100, a café, occasional bar and inline skate hire. (Ideal for use on the promenade adjacent to the beach.) A varied ice skating programme is offered and caters for all levels of skater from complete beginners through to those who skate competitively I.e. Figure Skating and Ice hockey. Linx Ice Arena is home ot Aberdeen Ice Skating Club, Linx Skating Club and Aberdeen Ice Hockey Club. The Dumfried Ice Skating Rink, the Dumfries Ice Bowl, is located at King Street in Dumfries and features a 56 metres by 29 metres ice pad that allows for figure ice skating, ice hockey, public ice skating and ice skating disco and a six rink Curling pad. In addition it includes a Bowls Hall (Events Hall), Cafeteria / Bar and Conference Facilities. The Dumfries Ice Rink is home to the Solway Sharks Ice Hockey Club - Dumfries and Galloway's only senior Ice Hockey team, the Sharks have firmly established themselves as regular challenging force for silverware in the Scottish National League; and the Dumfries Demons Ice Hockey - over the last 10 years the Demon's have provided the opportunity for those caught by the ice hockey bug to train and play in a friendly and fun set-up. 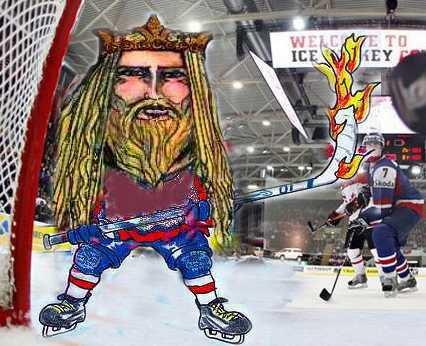 The Demon's pride themselves on their fun approach to ice hockey and welcome all to either watch or even play. The Dundee Ice Rink is a state of the art multipurpose ice arena offering an excellent skating venue for all ice users. The Dundee Ice Arena offers a variety of public skating sessions throughout the year. All the public skating sessions are manned by ice stewards and the Dundee Ice Arena do have a very strict ice safety policy. 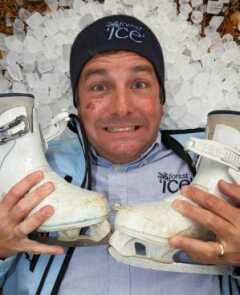 All members of the ice arena staff are first aid qualified for all those little trips and falls so don't worry. The Dundee Ice Skating Rink has an array of ice hockey development at all levels from junior development set-ups from under 10's through to the under 19's, and are home to both SNL Clubs: Dundee Stars and Dundee Tigers who both play in The Scottish National League. The Dundee Ice Arena currently offer curling two days per week. Curling does not operate during school holidays or public holidays. (Curling season runs from October to March.) Dundee Ice Rink is the home of the Dundee Speed Skating Club the Dundee Speed Skating Club was reformed when the Dundee Ice Arena opened its doors in September 2000. The speed skating club is open to all ages and abilities. In addition the Dundee Ice Skating Rink has seven resident coaches who are available to take skating lessons for the more serious skaters. The East Kilbride Ice Skating Rink is situated within East Kilbride's Olympia Shopping Centre and caters for general skating as well as curling. Facilities available here include general ice skating, learn to ice skate programmes, curling sessions and 50+ ice skaters sessions. From Sunday to Wednesday 10:00am–8:00pm / Thursday to Saturday 10:00am–10:00pm / Christmas Eve 10:00am–8:00pm / Boxing Day 11:00am–10:00pm / Hogmanay 10:00am–6:00pm / New Year's Day Noon- 8:00pm / Closed Christmas Day One of Europe's largest open air ice rinks and one of Britain's most beautiful, the Winter Wonderland ice rink is set beneath the dramatic Edinburgh skyline in the stunning surroundings of Princes Street Gardens, filled with twinkling festive lights. Each year, over the Christmas and New Year holiday period, an open-air ice rink is created in East Princes Street Gardens. The rink is situated beside a small funfair in the gardens, in the valley between the Scott Monument in Princes Street and the Head Office of the Bank of Scotland in Bank Street at the top of the Mound. 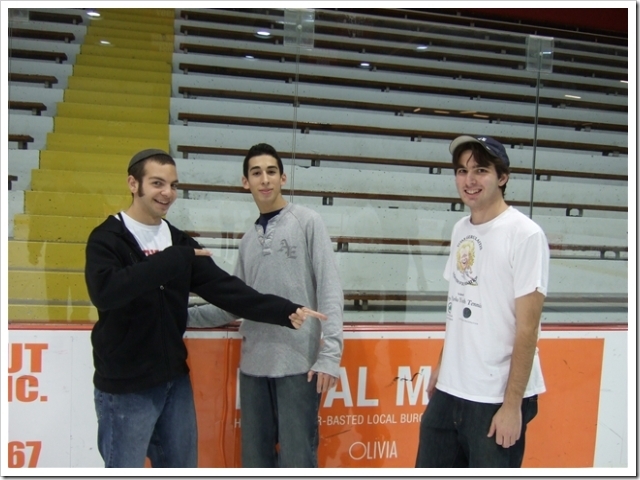 Here is the rink in December 2002. It is 40 metres long and can accommodate over 300 skaters. The Elgin Ice Skating Rink is located in the Moray Leisure Centre which has excellent ice skating facilities catering for all ages, abilities or interest. From Skating to Curling, Ice Hockey to Figure Skating; from the absolute beginner to the serious skater - with Ice Discos and Children's Parties also held regulary. Public Ice Skating Sessions take place throughout the week and are available for everyone. In addition there are special 50+ ice skating sessions. The Elgin Ice Rink encourages those with special needs to come skating. Wheel chairs are allowed on to the ice with a helper and a disabled skating chair is available for use. Parents and Toddlers sessions are held weekly and are aimed at getting both parents and children involved in the same activity.The Elgin Ice Rink at The Moray Leisure Centre also offers skating lessons for all ages and abilities. Childrens lessons start as young as 5 and its never to late to learn. Lessons cover all the basics from stopping and getting back up, through to beginner's ice hockey and figure skating. Curling is played in the ice rink from the beginning of September until the end of March. Family Skating and Family Disco sessions are aimed at specifically the families who wish to do things together. Children are only allowed if parents are skating and vice versa. The ever popular Glasgow On Ice will return this year and promises to be better than ever! Wrap up warm and soak up the festive atmosphere in the iconic setting of George Square! Don’t stay home and hibernate! Embrace the elements, don your best woolly hat and gloves and race to George Square for some dancing on ice at Glasgow’s newly remodelled skating rink. Skate around the monument in the heart of the square under the Christmas lights and afterwards stop off at the Festive Market for a warming glass of seasonal cheer. Braehead Arena is an exciting venue in a stunning location on the banks of the River Clyde just outside Glasgow.We'd like to break the ice as of Monday 17th December the small ice rink in our leisure mall will be closing. From that date all skating will now take place in our Olympic sized Arena, so you can look forward to a whole lot more fun. Think of the most fun you've ever had in a swimming pool. Now think of the most fun you've had at an ice rink. Double it or maybe even quadruple it, and you've got some idea of how much fun the whole family can have at the Waterfront Leisure Complex. It's the fun capital of the West. A leisure complex with a unique combination of ice and water thrills. With everything from an outdoor lagoon to a tropical wave pool and ice discos and curling rink. Inverness Ice Centre, which boasts a five rink ice facility for curling, skating and ice hockey, changing accommodation, social area and offices, has been purchased by Inverness Ice Centre Limited, supported by an award of £139,000 from sportscotland’s Lottery funded Sports Facilities Programme, together with additional funding from Inverness City’s Common Good Fund and Highland Council’s Education Department. The centre has proved extremely popular with the people of Inverness since it opened in 1967 and currently has a membership of over 1000. When fears were raised in 2001 that the centre might be lost to the commercial business sector, Inverness Ice Centre Limited rallied to retain it as an ice sports facility. The centre which is used by numerous Curling Clubs, Wheelchair Athletes, Moray Firth Ice Hockey Club, Inverness Skating Club, the Moray School of Skating and the general public, hopes that the relaunch of the centre will alert more people of all ages and abilities in the area to the facilities the centre has to offer and encourage them to take part in one of the many activities. North Ayrshire Leisure Limited operates two ice rinks, one at Auchenharvie Leisure Centre and the other at the Magnum Leisure Centre. Auchenharvie's ice rink is a split level rink, with the lower level marked out for curling.The Magnum's ice rink is a larger flat rink with a number of lanes marked out for curling. The ice complex offers recreational skating, a seven rink curling facility, ice hockey matches and for the coolest 12-18 year olds "Club Max", the "Nightclub on Ice for Teenagers". The only Ice Rink in the Borders is in Kelso. Public Skating sessions take place every Sunday afternoon and Evening between September and March, with the Skittle Alley and Public Bar next door. The ice rink at the Galleon Centre is 20 meters by 44 meters with a seated viewing capacity extendable to 400. The Lagoon Leisure Centre is the Flagship Centre of Renfrewshire Leisure, and offers activities to suit everyone! If you are interested in trying Curling for the first time our friendly welcome is extended to visitors of all abilities, have a look at our Come Curling page for details on how you can get involved or find the answers to some common Curling questions on the Curling FAQ page. For those curlers with a competitive streak we have listed our upcoming Events and keep our Results browser up-to-date. 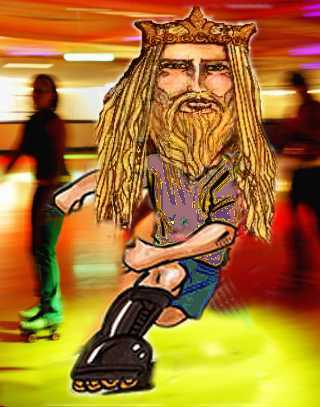 Skating is an individual sport for all ages and abilities. Is skating for you? - If you are looking for an activity that's fun, a competitive sport or simply a pleasurable way of keeping fit, skating is the sport for you. What is on offer? 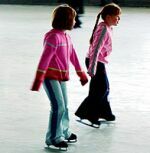 - You can skate for fun and enjoyment at public skating sessions with ice discos or you can learn the skills of figure skating with our qualified coaches. The sessions are on offer to both adults and juniors. Skates are supplied for hire at the ice rink. Keep fit and learn at your own pace. A variety of sessions to meet all levels of ability. Learn to Skate sessions with free tuition from our resident qualified coaches. Skate Hire is available with over 1000 pairs ranging from child's size 4 to Adult size 14. Safe friendly environment for all ages, particularly youngsters. Ice Activities such as public skating, learn to skate lessons and snowbabes for pre school children are available. Stirling Ice Rink was opened in 1980 to cater for ice sport's needs in Central Scotland and is now owned by over 500 proud shareholders.Over the years the rink has become home to many clubs from the Central Belt and surrounding areas, who use the rinks facilities for Curling, Ice Hockey, Speed Skating and Figure Skating as well as this the rink also hosts Public Skating every Weekend. The rink has also over the years played host to many major domestic competitions, as well as hosting visitors from overseas, which has helped the rink build a reputation Worldwide for it's good curling and friendly atmosphere. We have a session to suit everyone. Whether you're accomplished or learning. Contact your local rink for more information Why not learn to skate with professional trained coaches. We have excellent courses for all ages approved by NISA .FRISKY FRIDAY U18 SKATING: It's FRIDAY and here's where the fun starts with a session for young skaters. There's great lighting and all the sounds from clubland.Whether a complete novice or an experienced skater there is a session for you and your family at any of our arenas throughout the UK. Cardiff's Winter Wonderland returns to the beautiful Civic Centre for the eleventh time in 2011. The magical Admiral Open Air Ice Rink is back between Thursday 17th November 2011 - Monday 2nd January 2012 giving a cool 47 days of skating. Whether you are an experienced skater or a complete beginner the Admiral open air ice rink at Cardiff Winter Wonderland is an essential winter experience. Whilst the rink remains the focus for skaters and spectators, there are plenty of other attractions around the arena for all the family including the ice cafe bar, heated terrace overlooking the ice, traditional children's carousel and rides. The grounds of the National Waterfront Museum are being transformed into a children's paradise, providing fun for all the family. The Admiral giant wheel will be the star of the show again this Christmas, as one of the biggest touring wheels in the UK returns to offer brilliant views across the city. A traditional carousel, a new snow storm ride, ice rink and other favourites will complete the fun fair area, providing attractions for the whole family. online at www.waterfrontwinterland.com or from Swansea's Tourist Information Centre on Plymouth Street.Waterfront Winterland will also include the 44-metre Admiral giant wheel, Santa's Grotto, a funfair area, a traditional carousel and live entertainment. Last year saw 115,000 people visit the attraction. The Deeside Ice Rink is the National Centre for Ice Sports in Wales and is located at the Deeside Leisure Centre in Queensferry in Deeside and features and Olympic sized Ice Rink, some 60 metres by 30 metres suitable for a wide range of ice sports and activities, including Ice Hockey, Curling and Disco on Ice. Ice Skating is the perfect exercise for all ages, as it is one of the few sports in which the whole family can take part in. Lessons are available. Whether you're an experienced skater or a novice, you'll join thousands of others who enjoy the fantastic facilities at Deeside Ice Rink. The ice rink also holds Ice Shows from time to time by the Deeside Ice Skating Club. Deeside Ice Rink is also home to the English National League Division 1 ice-hockey team the Flintshire Freeze. 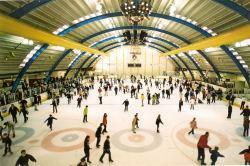 Dundonald Ice Bowl is home to the only Olympic sized Ice Skating Rink on the Island of Ireland. With DJ entertainment every weekend as well as games, prizes and of course skating all under the incredible glitter ball lighting, it really is a magical experience. The Dundonald Ice Rink hosts a feast of activity including the annual N.I Open Skating championships, skating concerts, music concerts and events and Ice Hockey and Ice skating lessons, as well as the ability to accommodate over 1500 skaters every day of the year. Off the ice at the Dundonald Ice Rink there is a wide selection of hot and cold vending machines, and seating to accommodate over 600 spectators. There is also an excellent sports cafe, Alaska, with pool table and live satellite television, serving a selection of kids boxes and adult meal deals. There is also a fully licensed restaurant Lattecino next door. Figure skating courses and Ice Hockey lessons are run every week. With spectacular covered ice rinks, festive fun, striking new venue design, entertainment and bars and cafes, there is something for everyone at 7up Christmas on Ice at the Liffey Valley Ice Rink, from families, school children, teens, young adults to corporate or general groups. To book: Telephone 0844 847 1722 or click here to buy online Get your skates on - 'cos 7UP Christmas on Ice is coming to The RDS AND Liffey Valley. Book now to beat the winter blues! Since our last year-round ice rink closed down, 7Up Christmas on Ice has become a firm favourite in the Irish christmas calender. It's a great way to relax and get into the Christmas Spirit without having to face the madness that is christmas shopping on a Saturday Afternoon (ick)! And this year, those clever folks at 7UP have added an extra Ice-Rink at Liffey Valley Shopping Centre, making it twice as easy for us to enjoy the festive fun. 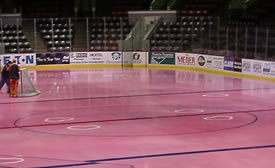 Fun Ice has supplied their synthetic ice rinks to many successful venues. This unique surface is dry so there is no mess. 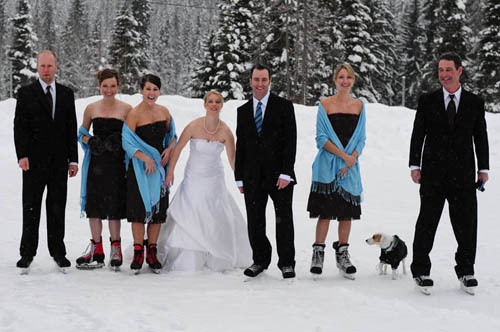 It is not cold (it is ideal for skating in ball gowns and tuxedoes). 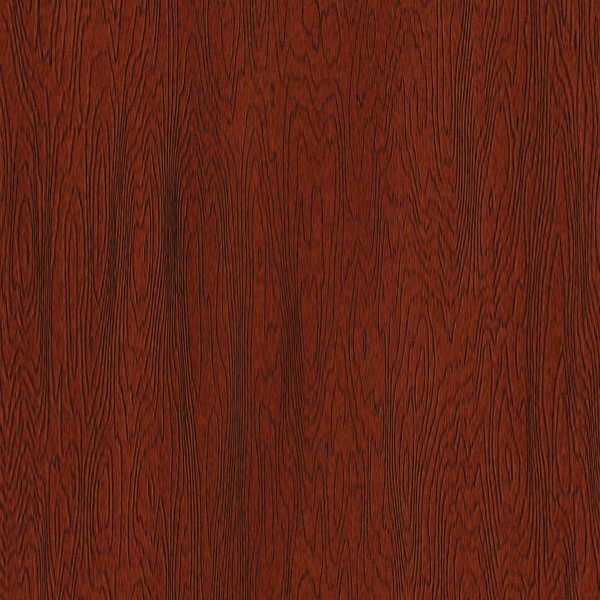 The surface is made up of a jigsaw formation so it can be adapted to suit any area. They carry a wide range of genuine ice skates ranging from a child's size 9 to adult size 11.Many people have converted from the wet ice rinks with its costs and limitations to the unique Fun Ice Rinks. It can installed in just one hour and the fully trained personnel will take the worry out of your event.The rinks are portable and artificial making them ideal for temporary installations. We at Fun Ice are very proud of our safety record. In over 14 years, and many tens of thousands of happy skaters, we have never had a claim made on our public liability insurance. The whole team take the safety of our portable rinks very seriously. in addition to our public liability, we supply a full risk assessment form plus a 17 page health and safety documentation pack. 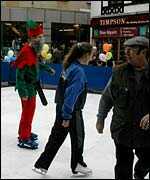 Fun Ice has been established for many years and is the country's leading specialist supplier of synthetic mobile ice skating rinks. 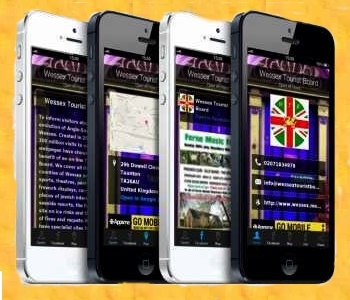 Founded in 1993 our reputation and client base has grown each year with many of our clients re booking regularly. 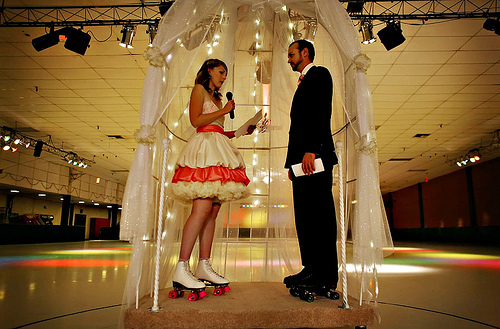 Fun Ice prides itself on each event having the personal attention of one of our Directors. 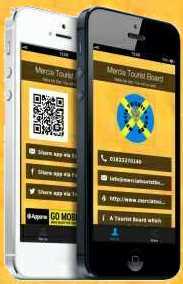 Each event is tailored to the individual client. Our unique surface is dry so there is no mess. It is not cold (it is ideal for skating in ball gowns and tuxedoes). The surface is made up of a jigsaw formation so it can be adapted to suit any area. We carry a wide range of genuine ice skates ranging from a child's size 9 to adult size 11. Many people have converted from the wet ice rinks with its costs and limitations to the unique Fun Ice Rinks. We can install in just one hour and our fully trained personnel will take the worry out of your event. Our rinks are portable and Artificial making them ideal for temporary installations. Info. 25000 sq.ft. rink, Car parking. here are the ones that have been submitted. Milton Keynes Roller Dance Club. Skating Club: Milton Keynes Roller Dance Club. School Sports Hall, Contitution Hill, Norwich. Skating Club: Medway Roller Dance & Social Club and Meridian Roller Figure and Dance Club. Farnham Leisure Centre Dogflud Way Farnham Surrey GU9 7UD. Tel. 01252 723208. King Alfred Leisure Centre Hall Kingsway, Hove, East Sussex, BN3 2WW . Tel 01273 290290. Kingstonian Hall University of Nottingham, Sutton Bonington Campus, Nottingham, Nottinghamshire. Maidstone YMCA Sports Centre Melrose Close, Off Cripple Street, Maidstone, Kent. ME15 6BH. Tel 01622 743317 Fax 01622 743242. Newmarket Sport Centre Newmarket, Suffolk. Skating Club: Meridian Roller Skating Figure and Dance Club. Rhyl Sports Centre - Rhyl High School, Grange Road, Rhyl, Denbighshire. Stirling Sport Centre Rochester Kent. Skating Club: Maidstone Y Roller Dance Club. Where can you go skiing in Britain? There are 77 real snow and artificial ski slopes in Great Britain. 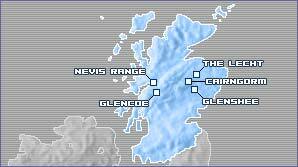 Scotland has the only natural ski resorts in Britain. There are five areas in which to ski and all have invested heavily over the last few years to rival the standards in many European resorts. Cairngorm, Glenshee and The Lecht resorts can be found in the Grampian mountain range, while the Nevis Range and Glencoe resorts are situated in the west of Scotland near Ben Nevis. The ski season tends to run from December to April and because low cost airline carriers fly to Edinburgh, Glasgow and Inverness, the cost of skiing keeps coming down. You can also ski in the Lake District in Cumbria when there is sufficient snow. There will be a fund raiser and celebration for the British Ski Team on Tuesday 19th January, 2010, just before our athletes head off to Vancouver for the Winter Olympics. We would love you to be involved, if you think it's something that would benefit your company. The evening is a very entertaining affair with canapes, champagne and cocktails. Sponsors are invited to put a table out with brochures and information, if they'd like. Many of the great skiing names are there like Dynastar, Salomon, and Rossignol along with companies that are not ski related at all, but specialize in servicing a similar demographic. Not surprisingly, for example, beach holidays, mountain climbing, jungle treks, and cultural tours all sell very well to this crowd. Celebrities will be attending the event like Formula 1 World Champion Damon Hill, Olympic Gold Medalist Steve Redgrave, sprinting star Colin Jackson, along with the British press like the Daily Mail and Ski & Board as well as TV broadcasters like Channel 4. There are often Hollywood celebrities too like Billy Zane and Honor Blackman and the Ski Club of Great Britain promotes the event heavily to over 30,000 skiing members. Lots with a value of at least £1500 are needed to make it into the live auction as our donors are often very generous. In the past, our very top lots have been valued at up to £20,000 for First Class tickets on British Airways. Having said that, we're grateful for anything to help our winter athletes ! If you would like a bit more information, you can simply go to www.ask4events.com. If the event seems interesting or exciting to you, please don't hesitate to drop us a line at simon@ask4events.com and we will send you a copy of the official invite for you to look at. Since 1961, Cairn Gorm has been a major winter sports destination and still offers skiers and boarders some of the best and most challenging runs in Scotland. Added to that, it has the only mountain railway in Scotland which transports skiers up to the higher lying snowfields in total comfort and safety in only a few minutes. For ski and snowboard condition reports go to Full Conditions. CairnGorm Mountain is located in an area specially protected under European environmental law - please help us preserve this unique landscape - we respectfully request you undertake all your activity respecting the Conservation Site Boundaries. Located 74 miles north of Glasgow, Glencoe extends over 200 hectares and operates on the Meall A'Bhuiridh Massif, amidst some of the most stunning scenery in Scotland. Originally known as White Corries, Glencoe was the first commercial Scottish Ski Area with the construction of the first overhead ski lift on Meall A'Bhuiridh in 1956. We now operate 7 days a week not only providing our customers with better service, but also employing around a further 30 staff in the winter season. With 7 lifts and 19 runs, Glencoe is by no means the largest ski centre in Scotland, but it's still a firm favourite with many Scottish skiers and boarders thanks to its unique and exhilarating terrain, and a snow holding record second to none. Glenshee Ski Centre offers the UK's most extensive skiing and snowboarding facilities - we hope you will enjoy our mountains of adventure. Glenshee - adventure in the making! Glenshee's impressive 21 lifts and 36 runs offer an amazing diversity of natural terrain for all standards of skiers and snowboarders. There are lots of options to choose from - you can join a class, go private, hire an instructor for your group, get into race training or simply take advantage of one of our great value package deals. Skiing has been enjoyed on Aonach Mor since the 1930’s, predominately by local skiers. 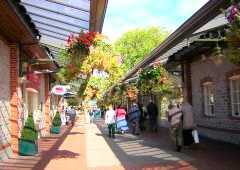 However it was not until 1968, that the area’s full economic potential was recognised. In 1974 a planning report was produced, sponsored by the Scottish Tourist Board, concerning the prospect of a winter sports development in Fort William, and essentially developing the area as an all year round tourist destination. The installation of the skiing facilities at Aonach Mor were implemented as a multi-phase project, with one of the latter developments; the Braveheart Chair, being constructed during 1997, eight years after the ski centre first opened. The best area was to found on Raise in the Helvellyn region of mountains. Early members proceeded to build a rope tow. Since those early days the club has progressed with the help of dedicated members and has today a modern button lift. Events - Men's 15 + 15km pursuit, women's 7.5 + 7.5km pursuit, men's individual sprint, women's individual sprint, men's team sprint, women's team sprint, mens 4 x 10km relay, women's 4 x 5km relay, men's 15km individual, ladies 10km individual, men's 50km mass start, women's 30km mass start As the winter weather has proved, nobody likes walking in the snow. Nobody that is, other than these crazy cats who do it for a living. Cross-country skiing would appear to be among the more relaxed winter sports, with hundreds of competitors taking a mass stroll in the snow. But it has become embroiled in one of the biggest drug scandals in Olympic history. At Salt Lake City 2002, the Austrian team, somewhat foolishly, left their blooding doping equipment lying around their residence in the village.It wasn't WADA's super sleuths that lifted the lid on their foul play, but a cleaner, who noticed the syringes and got the feeling something was awry. That came just a year after six Finnish skiers tested positive for banned substances at the World Championships, while two Russian medallists in 2002 were thrown out of the Games. Who would have thought these snow ramblers could be so under-handed? Great Britain has never had an Olympic cross-country skier and have never even looked like it - until now. Andrew Musgrave - an 18-year-old Scot - has been making a name for himself in cross-country circles. Based in Scandinavia, Musgrave has become known by the natives as ‘the Brit who isn't actually that bad' - an accolade not to be dismissed lightly. The teenager came 42nd at the World Junior Championships last year and 82nd in his first World Cup appearance, while he was the top junior in a recent race in Sweden.He's the British No.1 but next to no-one in his homeland would recognise him in the street - just the way he likes it.But with cross-country skiers tending not to peak until their late 20s, Musgrave may have to get used to the attention if he continues to progress like this. According to the record books, Great Britain remain without an alpine skiing Olympic medal, despite Alain ‘Highlander' Baxter's best efforts in Salt Lake City in 2002.He did finish third but was stripped of his bronze medal by the IOC, essentially for using a Vicks inhaler, just days later. Baxter is bidding to make his fourth Olympic appearance in Vancouver but at 35 and hampered by injuries, the flying Scotsman looks a million miles away from reaching the podium in Canada. He will be joined in the men's ranks by half-brother Noel Baxter as well as youngsters Ed Drake and Dougie Crawford, who have been performing admirably at the World Championships in Val d'Isere. Noel Baxter however has seemingly developed the same taste for the treatment table as his older brother while 2010 will come too soon for Drake and Crawford. Expect the Austrians and the Swiss to battle it out for the medals, unless American bad boy Bode Miller can reproduce his 2002 double silver medal winning form. The women's event looks a great deal better for Great Britain - not least because our only entry will be the blue-eyed, blonde bombshell Chemmy Alcott.Alcott is producing her best ever form at the World Championships in Val d'Isere at the moment, just weeks after breaking her ankle.Ever the optimist, Alcott believes she is capable of claiming a medal in Vancouver and she has proved she has the talent with an 11th place finish at Turin 2006 - the key will be staying injury-free. Perhaps the oddest winter sport that will be on show in Vancouver, biathlon tests both long-distance skiing skills as well as marksmanship. The competitors resemble Nordic warriors as they embark on sizeable snow treks with rifles slung over their shoulders, picking up points for speed as well as accuracy. It's popular with the military in Great Britain and with the distances involved, it's not for the feint-hearted. Team GB may be able to muster one or two competitors in Vancouver but the days of six-time Olympian Michael Dixon are long gone. Dixon achieved a best finish of 12th at Albertville in 1992 and is one of only seven people to compete at six different Olympic Games - a true warrior. British hopefuls include South African-born Peter Beyer and British No.1 Lee Jackson for the men, while Adele Walker and/or Emma Fowler may represent the GB ladies. Without ranging snow deserts anywhere to speak of in Britain however, the medallists will not be coming from Team GB unfortunately. Unsurprisingly it is the Scandinavians that dominate biathlon but be on the lookout for Germany to spring a few surprises. There are three real snow centres in England & one in Scotland now . They are open all year round, give a real snow experience and allow people to try the sport without the expense of travelling to Scotland, the rest of Europe and beyond. Yes, it really does snow in Yorkshire every night! SNO!zone Castleford welcomed it's first visitors in October 2003 and since then millions of people have been to enjoy the slopes and apres ski! The 170m long main slope is covered with over 1500 tonnes of fresh snow, and there is also a dedicated lesson slope for beginners and novices to build their skills and confidence before progressing to the main slope. Youngsters, and the young at heart also love whizzing down the slopes on daily tobogganing and ice slide sessions ...plus theres parties, 2 SNO!bars, conference centre and regular special events... so with all this and more going on you wont be stuck for choice!! And if thats not enough, SNO!zone is house inside Xscape, Yorkshires award winning entertainment destination so there's plenty of other activities on offer after you hit the slopes! Located at J32 off the M62 with 1,400 free parking spaces, dedicated train station and bus services. SNO!zone MIlton Keynes welcomed it's first visitors in November 2001 and since then millions of people have been to enjoy the slopes and apres ski! The 170m long main slope is covered with over 1500 tonnes of fresh snow, and there is also a dedicated lesson slope for beginners and novices to build their skills and confidence before progressing to the main slope. Youngsters, and the young at heart also love whizzing down the slopes on daily tobogganing and ice slide sessions ...plus theres parties, SNO!bars, conference centre and regular special events... so with all this and more going on you wont be stuck for choice!! And if thats not enough, SNO!zone is house inside Xscape, an award winning entertainment destination so there's plenty of other activities on offer after you hit the slopes! It is in the centre of Milton Keynes, next door to centre MK and the theatre district, and only 10 minutes away from the M1. Located 10 minutes drive from J14 off the M1 with onsite pay & display parking, and dedicated bus and taxi services. SNO!zone Scotland at Xscape Braehead welcomed it's first visitors in April 2006 and since then nearly a million of people have been to enjoy the slopes and apres ski! The 200m long main slope is covered with over 1700 tonnes of fresh snow, and there is also a dedicated lesson slope for beginners and novices to build their skills and confidence before progressing to the main slope. Youngsters, and the young at heart also love whizzing down the slopes on daily tobogganing and ice slide sessions ...plus theres parties, SNO!bars, conference centre and regular special events... so with all this and more going on you wont be stuck for choice!! And if thats not enough, SNO!zone is housed inside Xscape, Scotland's award winning entertainment destination so there's plenty of other activities on offer after you hit the slopes! It is just next to the M8 motorway and very easy to get to by car and public transport. 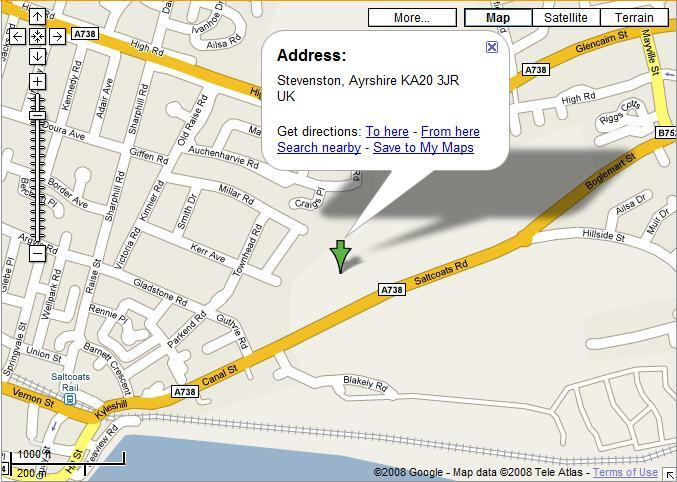 Located at J26/J25a off the M8 with free parking, and dedicated bus and taxi services. The Snowdome couldn't be easier to find, just 5 minutes from Junction 10 of the M42, so it's right on the motorway network, and only one and a half hours from North London, Bristol, Manchester and Leeds. The Avon Ski Centre, Lyncombe Lodge and Mendip Riding combined in one centre. 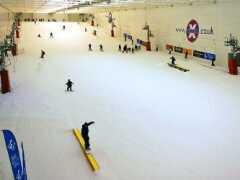 Christchurch Ski & Leisure Centre Matchams Lane Hurn Christchurch Dorset BH23 6AW.